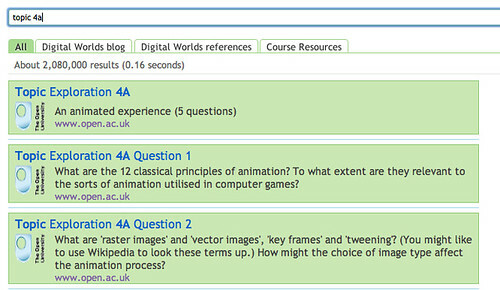 Over the last few days, I’ve been tinkering with OU Structured Authoring documents, XML docs from which OU course materials – both print and HTML – are generated (you can get an idea about what they look like from OpenLearn: find a course page with a URL of the form http://openlearn.open.ac.uk/mod/oucontent/view.php?id=397337&direct=1 and change direct to content: http://openlearn.open.ac.uk/mod/oucontent/view.php?id=397337&content=1; h/t to Colin Chambers for that one;-). I’ve been focussing in particular on the documents used to describe T151, an entry level online course I developed around all things gaming (culture, business, design and development), and the way in which we can automatically generate custom search engines based on these documents. The course had a very particular structure – weekly topic explorations framed as a preamble, set of guiding questions, suggested resources (organised by type) and a commentary, along with a weekly practical session. One XML doc was used per week, and was used to generate the separate HTML pages for each week’s study. 1) with a small index, it’s not really very satisfactory. If you only index exact pages that are linked to from the site, it can be quite hard getting any hits at all. A more relaxed approach might be to index the domains associated with resources, and also include the exact references explicitly with a boosted search rank. At the current time, I have code that scrapes external links from across the T151 course materials and dumps them into a single annotations file (the file that identifies which resources are included in the CSE) without further embellishment. I also have code that identifies the unique domains that are linked to from the course materials and which can also be added to the annotations file. On the to do list is to annotate the resources with labels that identify which topic they are associated with so we can filter results by topic. 2) the Google Custom Search Engines seem to behave very oddly indeed. In several of my experiments, one word queries often returned few results, more specific queries building on the original search term delivered more and different results. This gives a really odd search experience, and one that I suspect would put many users off. 3) I’ve been coming round more and more to the idea that the best way of highlighting course resources in a search context is through the use of Subscribed Links, that a user can subscribe to and that then appear in their Google search results if there is an exact query match. Unfortunately, Google pulled the Subscribed Links service in September (A fall spring-clean; for example of what’s been lost, see e.g. Stone Temple Consulting: Google Co-Op Subscribed Links). queries="week 4,T151 week 4,t151 week 4"
queries: these are the phrases that are used to trigger the display of the particular promotions links. Informal testing suggests that where multiple promotions are triggered by the same query, the order in which they are defined in the Promotions file determines the order in which they appear in the results. Note that the at most three (3) promotions can be displayed for any query. Queries may be based at least around either structural components (such as study week, topic number), subject matter terms (e.g. tags, keywords, or headings) and resource type (eg audio/video material, academic readings etc), although we might argue the resource type is not such a meaningful distinction (just because we can make it doesn’t mean we should!). In the T51 materials, presentation conventions provide us with a way of extracting structural components and using these to seed the promotions file. Identifying keywords or phrases is more challenging: students are unlikely to enter search phrases that exactly match section or subsection headings, so some element of term extraction would be required in order to generate query terms that are likely to be used. title: this is what catches the attention, so we need to put something sensible in here. There is a limit of 160 characters on the length of the title. description: the description allows us to elaborate on the title. There is a limit of 200 characters on the length of the description. url: the URL is required but not necessarily ‘used’ by our promotion. That is, if we are using the promotion for informational reasons, and not necessarily wanting to offer a click through, the link may be redundant. (However, the CSE still requires it to be defined.) Alternatively, we might argue that the a click through action should always be generated, in which case it might be worth considering whether we can generate a click through to a more refined query on the CSE itself? c) where they link to. title="Topic Exploration 4A Question 4"
queries="topic 4a q4,T151 topic 4a q4,t151 topic 4a q4,topic 4a,T151 topic 4a,t151 topic 4a"
At the moment, it is possible to exploit the T151 document structure to generate these canned navigational queries. The question now is: are promotional links a useful feature, and how might we go about automatically identifying subject meaningful queries? PS as ever, I tend to focus on tinkering around a rapid prototype/demonstration at the technical systems overview level, with a passing nod to the usefulness of the service (which, as noted above, is a bit patchy where the searchengine index is sparse). What I haven’t done is spend much time thinking about the pedagogical aspects relating to how we might make most effective use of custom search engines in the course context. From a scoping point of view, I think there are a several things we need to unpick that relate to this: what is it that students are searching for, what context are they searching in, and what are they expecting to discover? 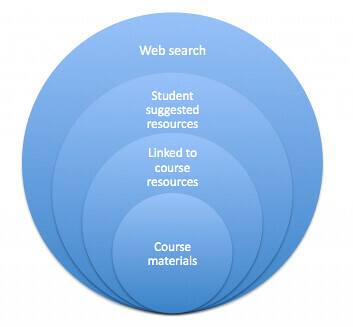 My original thinking around custom course search engines was that they would augment a search across course materials by providing a way of searching across the full text of resources* linked to from the course materials, and maybe also provide a context for searching over student suggested resources. It strikes me that the course search engine is most likely to be relevant where there is active curation of the search engine that provides a search view over a reasonably sized set of resources discovered by folk taking the course and sharing resources related to it. “MOOCs” might be interesting in this respect, particularly where: 1) it is possible to include MOOC blog tag feeds in the CSE as a source of relevant content (both the course blog content and resources linked to from that content – the CSE can be configured to include resources that are linked to from a specified resource); 2) we can grab links that are tagged and shared with the MOOC code on social media and add those to the CSE annotations file. (Note that in this case, it would make sense to resolve shortened links to their ultimate destination URL before adding them to the CSE.) I’m not sure what role promotions might play in a MOOC though, or the extent to which they could be automatically generated? video and audio resources: discovery in a large part will depend on the text on the web page the resources are hosted on. If the link is directly to an audio or video file, discoverability via the CSE may well be very limited! books: Google book search provides full text search, but this is not available via a CSE. Full text searchable collections of books are achievable using Google Books Library Shelves; there’s also an API available. I guess the workaround to all this is not to use a Google Custom Search Engine as the basis for a course search engine. 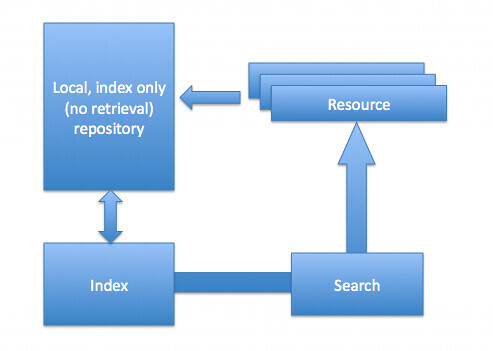 Instead, construct a repository that contains full text copies of all resources linked to from the course, and index that using a local search engine, providing aliased links to the original sources if required? – links into the social graph, such as the social connections of the author, or the discovery of people who have shared a link to the resource on a public social network. For an informal resource such as a blog post, it might be other posts linked to from the post of interest, or other posts that link to it. Thinking about resources as being part of one or more connected graphs may influence our thinking about the pedagogy. If the intention is that a learner is directed to a resource as a terminal, atomic resource, from which they are expected to satisfy a particular learning requirement, then we aren’t necessarily interested in the context surrounding the resource. If the intention is that the resource is gateway to a networked context around one or more ideas or concepts, then we need to select our resources so that they provide a springboard to other resources. This can be done directly (eg though following references contained within the work, or tracking down resources that cite it), or indirectly, for example by suggesting keywords or search phrases that might be used to discover related resources by independent means. Alternatively, we might link to a resource as an exemplar of the sort of resource students are expected to work with on a given activity, and then expect them to find similar sorts of, but alternative, resources for themselves. Have you had any success engaging folk in the use of CSEs? I’m starting to doubt their utility in a course context, though think they may have something to offer in a social context, eg when they index all the blogs of folk using a particular hashtag, in which case the CSE is a sort of socially inspired/topic focussed affair? Yeah, it seems to have largely fallen on deaf ears for me; I do think there is utility, even down to the individual doing it themselves, especially if it is simply a by-product of stuff they are already doing. As a for instance, I like showing people how with Google Reader they can search only the blogs they subscribe to, as another sort of ‘trusted lens’/off-board memory. I am not giving up hope, but I am also shifting my attention; I believe distributed search (open sourced software, distributed across millions of machines with multiple central index nodes) is where we need to go (from a “freedom” perspective), and I do think the constrained/custom search approach can tie in. I have felt like that for a while now, but the urgency of developing and deploying some working solutions along these lines seems much higher now than it did even a few years back. Previous Previous post: Data Referenced Journalism and the Media – Still a Long Way to Go Yet?